Riri Williams is one busy genius these days. In Boston, she's dealing with street criminals and an overbearing MIT dean. That would be plenty for an accomplished super-engineer, but Chicago has a lot of mysteries - including a very personal one - to throw at her, too. Let's start with the bandaid-ripping-offing. The first issue ended with a dramatic, ambiguous cliffhanger. Here, that cliffhanger is barely explained. The story rolls straight past the writhing mass of implications its non-explanation leaves behind. Ironheart #2 has an abrupt conclusion of its own, suggesting this title might have a problem with endings. The author provides some much-needed clarification on the "wha hoppen?" cliffhanger question on the letters page. While I always like to see a writer handling her own lettercol, I also like to see plot-critical information make it into the comic. Okay, salt dispensed! Endings aside, this is a brisk and engaging comic. It's got plenty of beats that demonstrate the creators have an excellent grasp of super-heroics in general (e.g. how Riri copes with damaged, non-flying armour) and their protagonist in particular (e.g. movie night at the Williams house delivers tons of brilliant character work). Ironheart #2 is also notably gorgeous. I'm not sure I have the comics savvy to understand precisely how an artist and a layout specialist divide up their work, but I can admire the smooth results. This is a very fast issue. It lays out Riri's challenges across an unusually large number of short, snappy scenes. The art does a formidable job of maintaining the flow of the story, and there's never a sense of confusion or omission. I may not know the workload breakdown, but I do know that this comic's visual clarity isn't a happy accident. It's the result of hard, talented work. There's also plenty of detail. The Ironheart armour is gloriously rendered in every panel. There's a brief but marvellous "armour-up" panel, and I'd be thrilled if that turned into a once-an-issue tradition. The art team also reserves a little TLC for Chicago. Riri chases a thief from Daley Plaza (home of the Picasso Horse Thingie) to the Cloud Gate (the Chrome Bean Thingie), and both locations look stupendous. It's also a realistic distance for a Chicago chase if the target is on foot: 3-4 blocks. Great colours round out the generally formidable visual presentation. Ironheart has a leg up thanks to her current armour's insanely great colour scheme; it does a perfect job of spotlighting her in action. But the Ironheart-free panels are excellent, too. There's a good spectrum running between the most intense colours for superhero action and the softer tones used in the quieter, more character-driven moments. 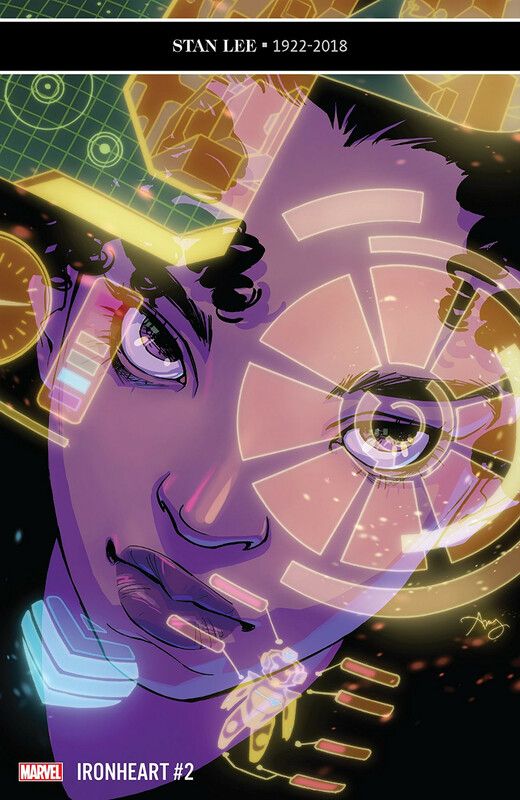 Along with all the action, Ironheart #2 devotes a remarkable amount of attention to Riri's emotional and social development. It does so in a more organic fashion than the previous issue. Filling out her backstory with more new/old characters is an excellent idea. It's off to a strong start here with her high school friend Daija. On the plot side, all of the challenges developing against Riri exist in a nebulous (but not frustrating) state of uncertainty. How much of what she's facing is connected to the Ten Rings? Everything? Nothing? I'm impressed that the creators have balanced things so that either answer - or any mix in between - has the potential to satisfy. Riri is having some branding issues and thus is insisting on "Ironheart" right now. But dangit, "Little Iron" is an adorable alternative!